High-vis and safety shirts are essential pieces of personal protective equipment when working around traffic or in other potentially dangerous environments. To meet the safety needs of a wide range of professionals, D.E. Gemmill Inc. carries an extensive selection of Class 2 and Class 3 reflective work shirts and related products. Our carefully curated inventory consists exclusively of items from manufacturers we trust, and that balance comfort and safety at an affordable price point. Browse through our products to explore our selection of reflective stripe work shirts and related safety clothing. Got a question about anything in our inventory? Contact one of our knowledgeable representatives who would be happy to help you. Class 1 high-vis clothing: Contains a minimum 155 square inches of reflective material. Class 1 clothing, including reflective safety vests, is suitable for use in low-risk environments such as road work in a residential area with a posted speed limit of 25 mph or lower, or construction work taking place far away from active traffic. Class 1 high-vis clothing typically includes vests or shirts made primarily from non-reflective materials. Class 2 high-vis clothing: Features at least 775 inches of safety yellow or safety orange background material and 201 square inches of reflective striping. Use Class 2 clothing in higher-risk areas such as traffic zones with speed limits up to 50 mph, airport runways, and busy construction sites. Class 3 high-vis clothing: Suitable for the highest-risk jobs, such as highway construction projects and any work in extreme weather conditions. 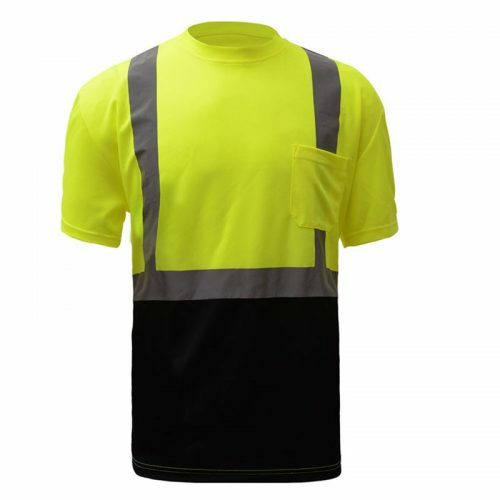 Class 3 high-vis shirts contain at least 1,240 inches of safety yellow or safety orange background and 310 square inches of reflective striping. The high-vis work shirts available at D.E. Gemmill Inc. typically meet Class 2 or Class 3 specifications. Each product page has full details to make it easy for you to make the right choice. High-vis construction shirts are just one component of an overall safety solution. Your work may require additional products, such as protective construction headgear, high-vis pants, eye protection products, and more. One of the benefits of working with D.E. Gemmill Inc. is that we specialize exclusively in on-the-job safety. As a result, we have a comprehensive selection of items available for construction workers, road work crews, oil and gas professionals, and any other individual concerned about safety. Explore our full catalog of products and place your order online today – we offer fast shipping and a customer-satisfaction return policy for maximum convenience. Our online store makes high-quality safety equipment available to working professionals across the country. Fully committed to your safety, we offer a full line of women’s safety apparel online and in our store. If you’re in the York, PA, area, consider visiting our retail location for in-person assistance from one of our team members. There, you can see our full selection of safety high-vis shirts for sale and take your products home today! We also offer mobile safety apparel sales to job sites within a 150-mile radius of our headquarters. Get in touch to request a visit or learn more!